﻿ 1 John 1:7 but if we walk in the Light as He Himself is in the Light, we have fellowship with one another, and the blood of Jesus His Son cleanses us from all sin. 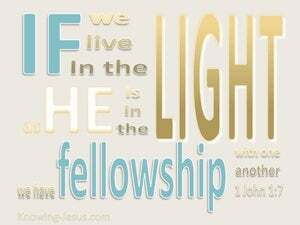 But if we keep living in the light as he himself is in the light, we have fellowship with one another, and the blood of Jesus his Son cleanses us from all sin. But if we walk in the light, as he is in the light, we have fellowship with each other, and the blood of Jesus Christ his Son cleanses us from every sin. But, if we live in the light [of righteousness] just like God [constantly] lives in the light [of righteousness], we can truly share a relationship with one another and [can know that] the blood of Jesus, God's Son, continues to cleanse [our spirits] from all of our sins. 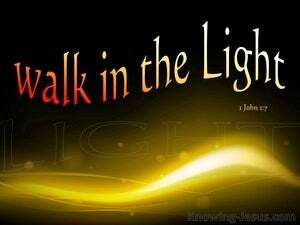 but if we walk in the light, as he is in the light, we have society one with another, and the blood of his son Jesus Christ cleanseth us from all sin. But if we walk in the light, as he is in the light; we have fellowship with one another, and the blood of Jesus Christ the Son cleanses us from all sin. 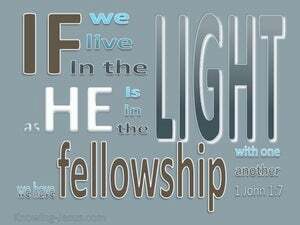 But if we live in the light, just as he is in the light, we have fellowship with one another, and the blood of Jesus his Son cleanses us from every sin. 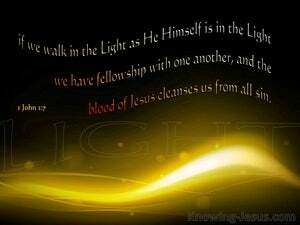 But if we walk in the light as he is in the light, we have fellowship one with another, and the blood of Jesus Christ his Son cleanseth us from all sin. But if we walk in the light, as he is in the light, we have communion with one another, and the blood of Jesus Christ cleanses us from every sin. But if we walk in the light as he is in the light, we have fellowship with one another, and the blood of Jesus his Son cleanses us from all sin. But if we walk in the light, as He is in the light, we have fellowship with one another, and the blood of Jesus Christ His Son cleanses us from all sin. but and if we walk in light even as he is in light, then have we fellowship together, and the blood of Jesus Christ his son cleanseth us from all sin. 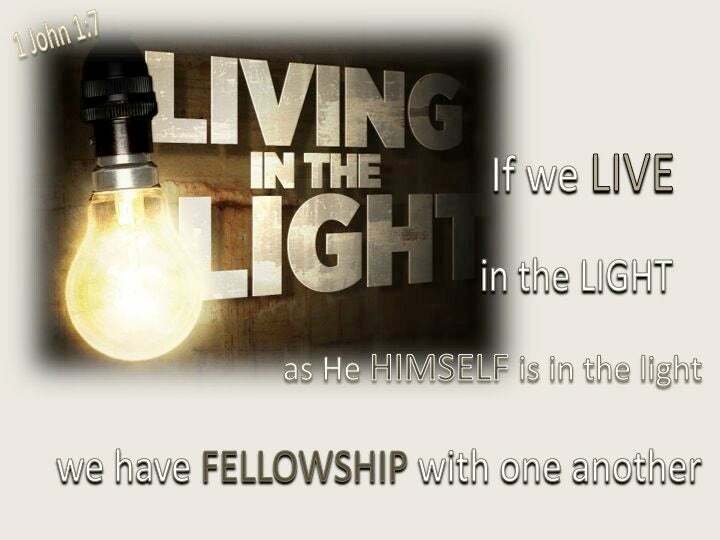 but if we live and move within the light, as he is within the light, then we have fellowship with one another, and the blood of Jesus his Son cleanses us from every sin. But is we are passing our life in the light, as he is in the light, we ever have partnership with one another, and the blood of Jesus Christ is cleansing us from every sin. 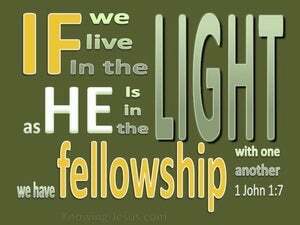 But if we walk in the light as he himself is in the light, we have fellowship with one another and the blood of Jesus his Son cleanses us from all sin. But if we walk in the light, as he is in the light, we have fellowship with one another, and the blood of Jesus, his Son, cleanses us from all sin. 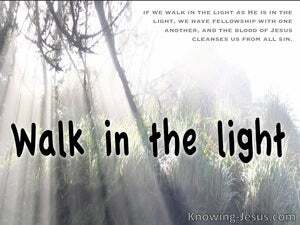 but if we walk in the light, as he is in the light, we have fellowship one with another, and the blood of Jesus his Son cleanses us from all sin. 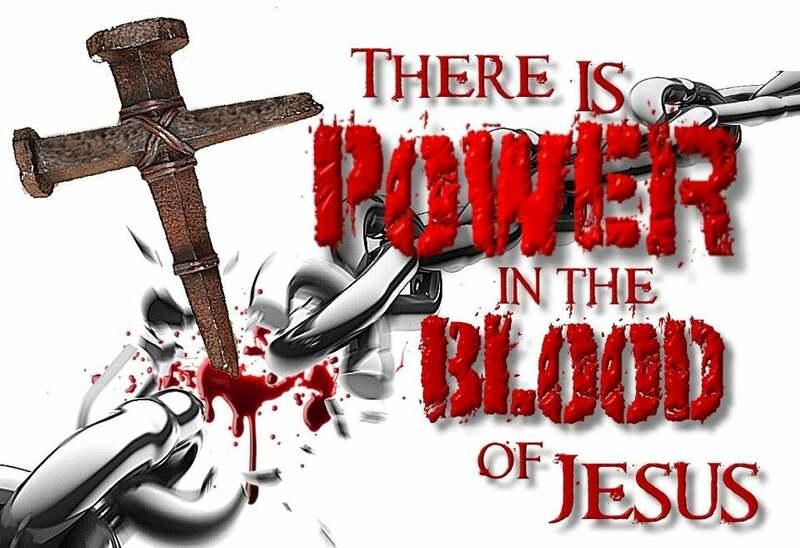 Whereas, if, in the light, we are walking, as, he, is in the light, we have, fellowship one with another, and, the blood of Jesus his Son, is cleansing us from all sin. but if we walk in the light, as he is himself in the light, we have communion with each other, and the blood of Jesus Christ his Son cleanseth us from all sin. But, if our lives are lived in the Light, as God himself is in the Light, we have communion with one another, and the Blood of Jesus, his Son, purifies us from all sin. But if we continue to live in the light, just as He is in the light, we have unbroken fellowship with one another, and the blood of Jesus His Son continues to cleanse us from every sin. 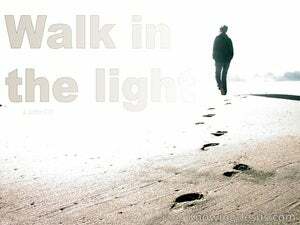 but, if we walk in the light, as He is in the light, we have fellowship with One another, and the blood of Jesus His Son cleanses us from all sin. 6 If we say that we have fellowship with Him and yet walk in the darkness, we lie and do not practice the truth; 7 but if we walk in the Light as He Himself is in the Light, we have fellowship with one another, and the blood of Jesus His Son cleanses us from all sin. 8 If we say that we have no sin, we are deceiving ourselves and the truth is not in us.